I touched a little on anxiety and on the importance of using visual strips in our house in my previous post Routines and the Meltdown Monster. Today I thought I would break this down further and dive into the world of routine strips, visual stories and visual queues. In the beginning we used visual strips for everything especially when the Monkey was non-verbal. When I say everything I literally mean everything from getting dressed, taking a bath, going to the store, getting ready to go, all the steps we do in the bathroom and the list goes on and on. 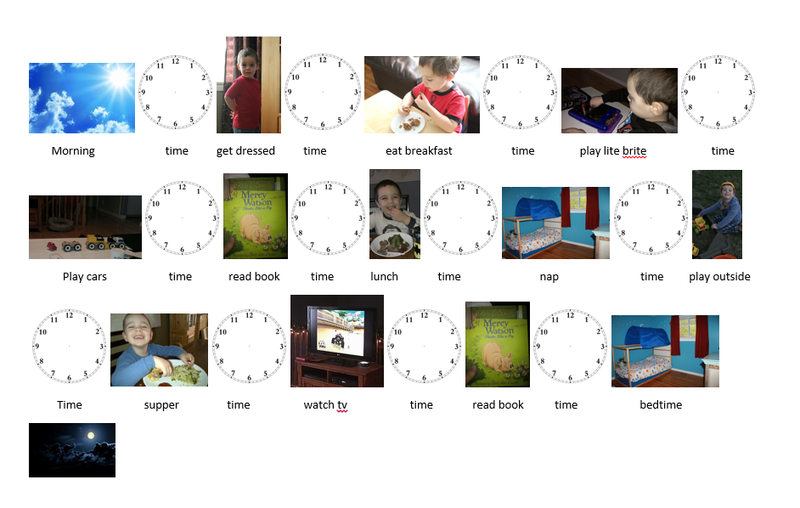 These visual queues helped ease his anxiety, allowed us to transition to new activities with fewer meltdowns, made it possible for us to communicate and helped him to finally speak (along with some other things I did that I will post about in future). The Monkey has autism there is no doubt about that but autism aside the drive for a lot of his behaviors is the anxiety. Now that he has been able to talk for a little over a year now and he is doing so well in so many other areas our main focus is on the anxiety and how we can help him now before he starts school. Lets start from the beginning. PECS (Picture Exchange Communication System) like these are basically where we started. These picture’s allow you to show the visual thinker what is happening and allows the visual thinker to use these pictures to tell you what they want. The images in most PECS are very generic and usually drawn or very basic pictures of none specific items. These images were too generic for the Monkey in the beginning and I ended up having to take pictures and print off my own PECS that would be more specific to our daily lives. Showing him an image of a drawn book did not relate to an actual book. He still tends to see the world in this sort of black and white separation of things but has gotten much better as time goes on. So if you have tried PECS in the past with little or no success I urge you to try taking actual pictures that relate to your daily life. We had pictures of our cars, his things like clothing, toys, tooth brush, books etc… We had pictures of our plates, our utensils, our favorite foods, all the stores we go to, the parks we actually went to, etc… Once I had literally hundreds of my own pictures taken I then laminated them all and used them as visual schedules and routine strips. 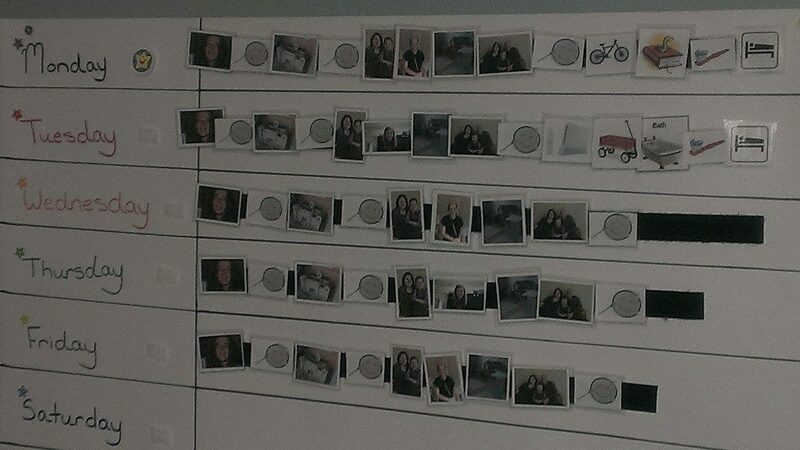 Rebecca also has used and uses visual strips and schedules for MJ with great results. They also found that generic images were not as successful as images they took themselves or drew with her present. MJ, although verbal, still benefited from these visual queues and schedules because like the Monkey and most children on the spectrum she is a visual thinker and she, like the Monkey, has high anxiety. Routine strips were a life saver which we still use regularly and without them the Monkey’s anxiety which is still very high would be extreme.So if you are not using routine strips or visual schedules I really urge you to try it. If you have tried the PECS before and found they didn’t really work then you may need to do like us and be much more specific with the images you choose to use. Your child may need to relate to the picture to understand the picture especially when they are young and non-verbal. It’s really a trial and error of what might work for your child. Will you need the clocks? May be not. Will pictures need to be as detailed? Maybe yes in the beginning or maybe your child will do great even with very generic images. For those of you already using visual strips what other tips would you have? For those of you not using them, if you have any questions please ask away. I know that it may seem time consuming and tedious at first but when you can ease some of the negative behaviors using them it truly is worth the time and energy.